I've been trying to eat fewer grains lately. This is tough for me - no one is a bigger fan of the white starch category than I am. But hey, I'm coming up on 50. I figure it's time to make a few adjustments. I came across a few "Paleo" recipes for fried chicken coated with almond meal instead of flour. I doubt I'll ever move all the way over to a true Paleo diet - it's pretty restrictive - but I thought I'd give almond-crusted fried chicken a try. I went full-on Paleo and fried the chicken thighs in coconut oil, but if you're not following the Paleo diet strictly you can use any other high-heat frying oil, like grapeseed oil or canola oil. ON THE SIDE: I served my fried chicken with my Not Ketchup fruit "ketchup" sauces, of course. Sweet and tangy, they're the perfect partner for this crispy, salty, umami-rich fried chicken. 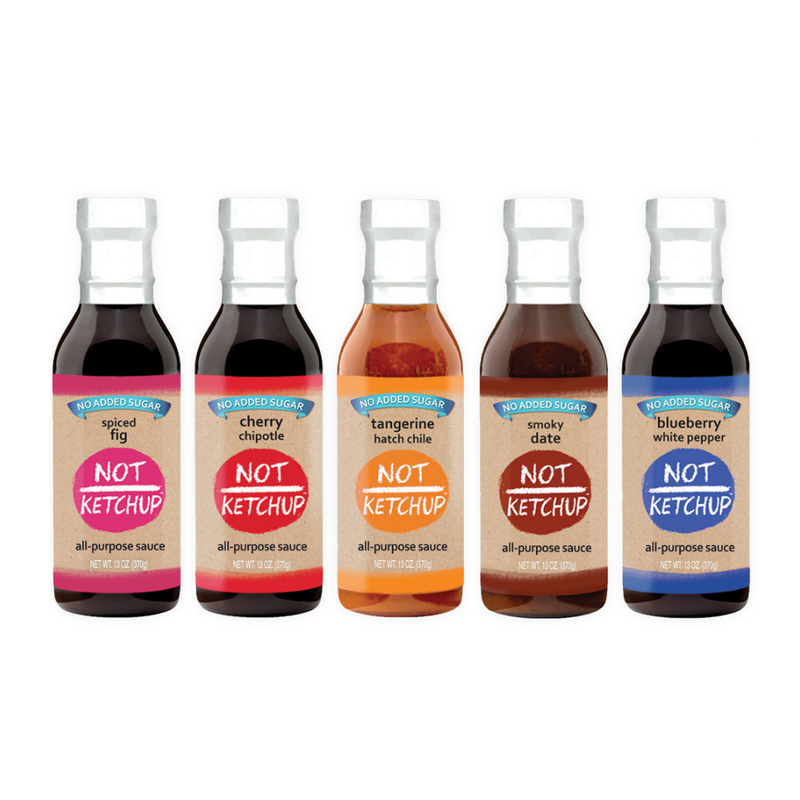 Pick up a bottle at NotKetchup.com or Amazon.com today! 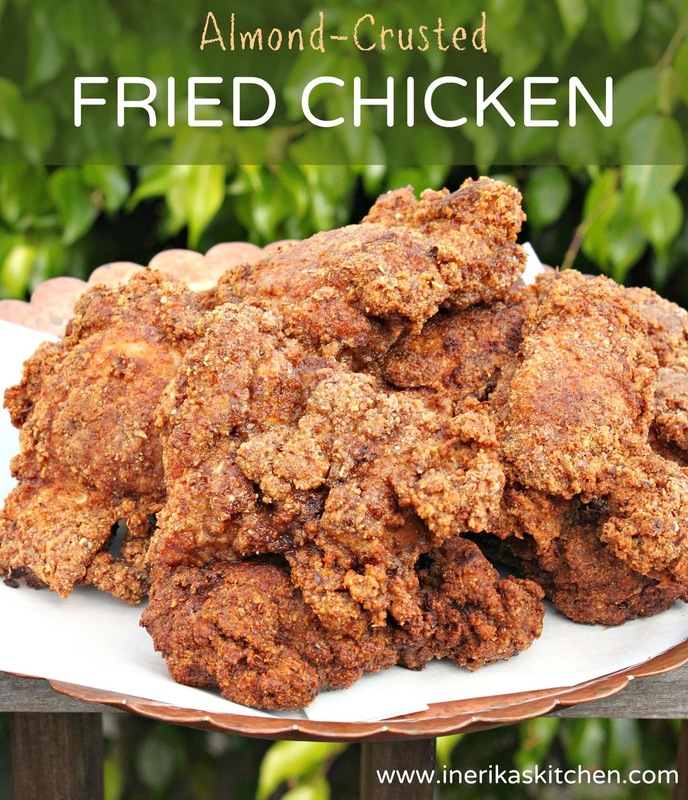 Fried chicken coated in almond meal and spices and fried in coconut oil. Grain-free, Paleo and delicious! Crack the eggs into a medium-sized bowl and whisk until frothy. In another bowl, mix together the almond meal, garlic salt, smoked paprika and pepper until combined. Preheat the oven to 325 degrees F.Heat the coconut oil over medium heat in a deep, heavy pot. I use a 5-quart cast iron Dutch oven. Get the oil up to about 350 degrees F. If you're too impatient to use a thermometer (like me), wait until the surface is visibly shimmering. Dip a piece of the chicken first into the egg, then into the almond meal mixture. Make sure the chicken is coated all over with the almond meal. Drop the chicken gently into the hot oil and fry until golden brown on both sides. You'll have to work in batches, frying three or four pieces at a time (depending on the size of your pot).When the chicken is golden brown, put it on a rack set over a sheet pan (or just on a sheet pan if you don't have a rack). When all the chicken is fried, slide the pan into the oven for 15 minutes. This will ensure that even the thickest parts of the chicken are cooked through and will re-warm the pieces you fried first.Serve hot with your favorite flavor of Not Ketchup for dipping. The chicken is yummy but, I noticed that the actual breaking didn’t stay on very well after frying it.. Any suggestions? Does putting in fridge and re heating or eating cold for lunch work like other fried chicken? Can I sub almond flour for coconut? @Andrew I haven't tried it with coconut flour, but it's definitely worth a try. Let me know how it works out!